This has turned out to be rather a long list, which isn’t surprising since this is where we started out in 1990-making things to sleep on! Then we just kept on adding products as people kept asking for them. We’ve put mattresses, bedding, bedlinen and blankets here. We’ve also included futons as so many of our customers use our full thickness futons to sleep on all the time rather than as an occasional bed. In this country we don’t tend to give enough thought to what we sleep on and we’ve sourced much of our bedding from Germany where the mattress is often only seen as part of the bedding ‘system’. By the time you’ve considered mattresses, underlays, overlays and protectors you might be thinking of the princess and the pea...But think again and you realise it makes a lot of sense, a good mattress is a big investment and will last a long time and a simple cotton mattress protector is easy to take off and pop in the washing machine compared to trying to get a mattress cleaned. "Thank you very much for making the most comfortable futon I’ve ever slept on! Having wonderful nights sleeps...."
Questions we are often asked, just contact us at mail@dojoeco.co.uk or give us a ring on 01938 552617 if you have any more! Handmade with certified organic and natural materials, our mattresses are just where you'd want to spend a third of your time! Click here for an overview or take a look below at the 3 types of mattresses (Wool, Coir and Latex) that we make. 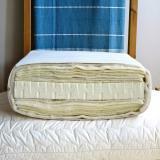 Our natural mattress with a high proportion of organic British wool. 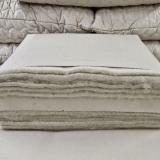 Our natural mattress with the highest proportion of 100% natural certified organic latex. Our natural mattress with a high proportion of 100% natural certified organic latex enclosing a core of coconut fibre coir. Questions that we are often asked, just contact us at mail@dojoeco.co.uk or give us a ring on 01938 552617 if you have any more! Flexible futon made from natural and organic materials. Click here for an overview or take a look below at the 3 types of futons (Traditional, Latex and Coir) that we make. An organic futon with a firm/cushioning feel. An organic wool futon that feels firm/hard. A futon with a firm/rigid feel.